Girls Night Out January 17! Last year, Amy Brenner was one of our Cincy Chic “Women of the Year,” and I’ve just grown to adore her. Basically she offers women a variety of healthcare services – from gynecology to skincare. So, when my friend at Vein Clinics of America told me about a Girls Night Out event she’s doing with Dr. Brenner, I knew I had to share it with you! This event is the perfect way to start out the new year! 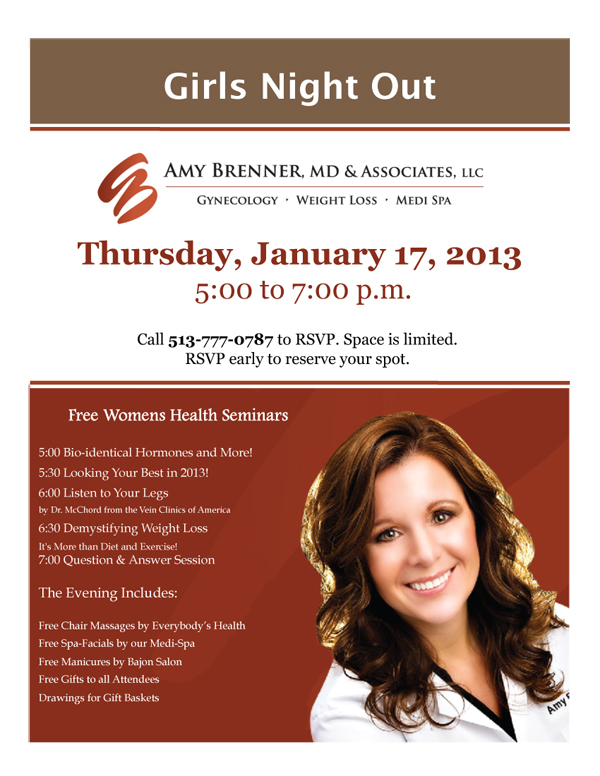 The Girls Night Out will be on Thursday, January 17 from 5-7pm and will feature free Women’s Health Seminars including topics like Bio-identical hormones and more, looking your best in 2013, listen to your legs, demystifying weight loss and a Q&A session to wrap it all up! You can also enjoy treats, samples and pampering like chair massages by Everybody’s Health, spa-facials by Medi-Spa, manicures by Bajon Salon, and gifts to all attendees and drawings for gift baskets. Make sure you RSVP to reserve your spot since space is limited! Call 513-777-0787 to get your spot!